When it comes to streaming, the SiliconDust HDHomeRun is like the Holy Grail. Not the Monty Python version…I’m talking about the Indiana Jones and the Last Crusade version of the Holy Grail. There’s one question I get asked all the time, and its usually some version of this: How do I stream live TV on my Android box? If you’ve ever wondered how to get your local channels, Sunday’s football game, or just the evening news on your streaming device, then this is how you can. If you’re old enough, you may remember the days before cable TV. 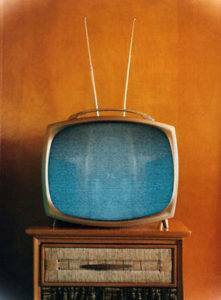 Back then, there were only a few TV stations and the signals were all transmitted over the air. You had a little “rabbit ear” antennas that stuck up from the back of the television. If you had an older TV or one without an antenna port, you may have had a separate box with antennae that connected to the TV with a ribbon cable. Since 2009 in the United States, analog signals aren’t being transmitted anymore, but that doesn’t mean that the antenna is dead. Far from it. TV stations are still being broadcast over the air, although you’ll need a better antenna these days. The TV stations are in digital format, not analog anymore, but the principal is still the same. When I’m explaining how HDHomeRun works, keep that mental image of the that separate box with the antennae that you connected to the TV. Think of HDHomeRun as a router. But instead of splitting up your Internet signal between several devices on your network, it’s going to split up your TV signal between devices on your network. Let me explain. Your Internet connection comes to your house through some outside source, like the cable company, DSL or satellite. Even if you only use a Wi-Fi connection, that signal is still coming from somewhere and being converted into wireless signals. For this example, I’m going to assume you’ve got cable Internet, but the principal is the same no matter what source you have. Generally, when your Internet comes into the house, it goes to your cable modem through a coax cable. If you’re confused about what that cable looks like, check out my TV connections article for more details. From there that signal goes from your cable modem to your router. Your router then splits up that signal, both wirelessly and through wired connections so that every device on your network can access the Internet. The router is basically acting like the traffic cop of your home network. It tells each device how to get the data it wants. You just see every device connected to the Internet. HDHomeRun works the same way. Your TV signal comes into your house one of two ways: through an antenna or through a box. If you’re using cable TV or satellite TV, then you’ve likely got a box for each TV. Usually this means you’ve been renting each box from the cable company for a small fortune each month. If you really want to get upset, do a quick calculation of how much you’ve paid just renting your cable TV boxes over the past year. If you’re using a powered HD antenna like a Mohu, then your TV is still coming in roughly the same way as far as this illustration goes. You’ll still be able to benefit from an HDHomeRun and you won’t need an antenna for each TV either. As I was saying, you’ve got a TV signal coming in and connected to each TV. Imagine if you took one of those sources and connected it to a “TV Router” that could split the signal. 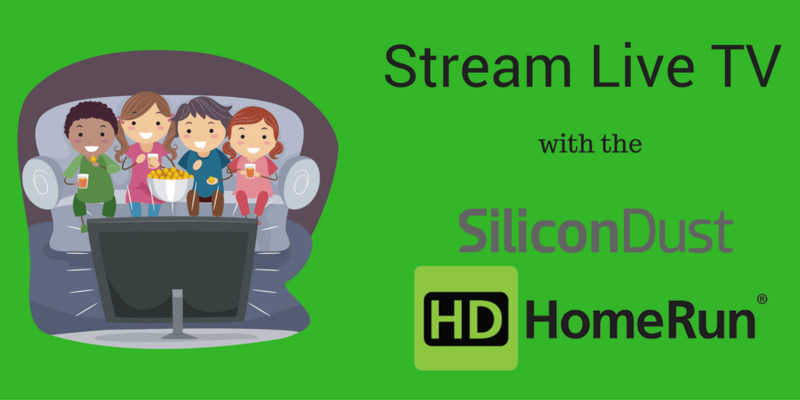 To stream live TV on any device on your network, all you need to do is use the HDHomeRun’s Android or Apple apps, or even their Kodi addon or Plex viewer. I’ll get into more details about the apps in another article, but for now I want to briefly go over each of the HDHomeRun devices. There are six of them in all, but each is designed for a specific type of customer. You should be able to quickly tell which one is right for you. How many tuners do I need? There are two broad categories of SiliconDust HDHomeRun devices: Consumer use and Commercial use. Even though this site is geared for regular home consumers, there’s still a couple of use cases I can think of to talk about the commercial SiliconDust TECH lineup. The biggest differences is in the number of tuners that the device will have built in. Generally speaking, the consumer versions of the HDHomeRun will have either 2 or 3 tuners which will limit you to…you guessed it…2 or 3 shows at any given time. For the SiliconDust TECH commercial lineup, they come with up to 8 tuners built in. As I said, there’s two separate model lines for SiliconDust: HDHomeRun Consumer and TECH Commercial. 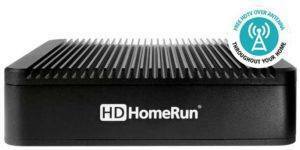 Only the Consumer products go by the name HDHomeRun, but the principal is the same. Both will let you access multiple TV channels at the same time so you can watch them on all of the devices on your home network. Which one is right for you? Let’s start with a description of each model. The HDHomeRun Connect is the easiest (and cheapest) way to watch live TV online on multiple devices at the same time. Think of it as the baby brother in the family. The Connect has two HD TV tuners so you can watch two different channels at the same time and stream them to your devices through the 802.11 ac wireless transmitter or Ethernet. All in all, the Connect is a solid entry in the lineup, but, like most little kids, it gets overshadowed by it’s bigger siblings. The HDHomeRun Extend is the most popular model in the consumer lineup, and actually the one that I’ll be giving a detailed review on soon. It went through a redesign in 2016 making it quieter and better cooled than the older version. Thankfully, it also nixed the glowing green logo on the front of the device, opting for a sleeker, more modern look. The reason it’s so popular is that it has one extra TV tuner than the HDHomeRun Connect, meaning you can watch up to three channels simultaneously. The HDHomeRun Extend is the only model which supports wireless networks as slow as 820.11 n. Both the Connect and Prime require 802.11 ac networks to provide HD quality streams. 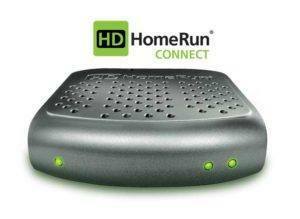 The HDHomeRun Prime is the oddball in the consumer models because it’s designed specifically for cable users. What makes the HDHomeRun Prime unique is that it is the only version that works only with an existing cable TV service using CableCARD. The other two models in the HDHomeRun consumer lineup will work with either over-the-air TV signals or with cable TV. But if you’ve got a CableCARD with your cable TV subscription, you can pug that card directly into the HDHomeRun Prime and ditch the cable box. Please note, that doesn’t mean you can cancel your cable TV subscription…at least to with this model. This will only let you use one CableCARD on multiple devices without spending extra money each month renting more cable TV boxes. As with the rest of the lineup, you can use the Prime to pause, record and watch live TV online using an app, Kodi addon or Plex channel. What if three channels aren’t enough? 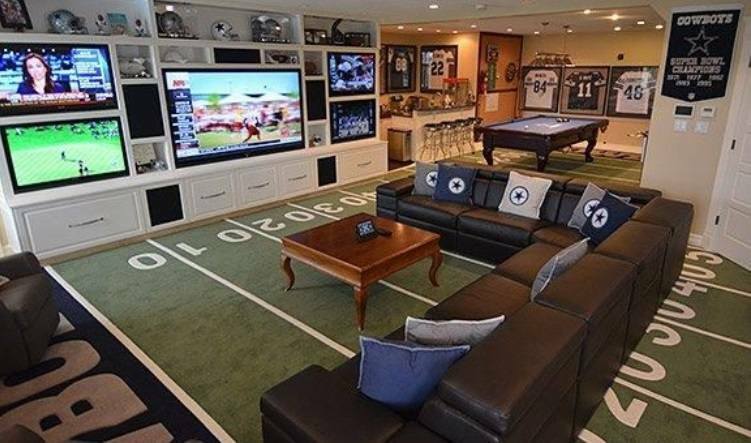 If you want to create the ultimate football man-cave like you saw above, then you’re going to need more tuners. That’s where the SiliconDust commercial lineup comes in. These devices are all a bit sturdier than the HDHomeRun lineup because they’re designed for “always on” use in a public setting. The Tech4-2US is the oddball in this group and I wouldn’t recommend it for home use. It has two TV tuners, the same number as the HDHomeRun Connect above, but it has an all-metal frame and wall-mount keys. Think of this as the box that could be running in your company’s breakroom TV. It’s nothing fancy, but it’s durable. Here’s where the commercial lineup starts to get interesting. The TECH3-6CC and TECH4-8US are both rack mountable devices designed for use in sports bars, restaurants and other places where you need to be able to watch multiple streams at the same time. If you want to design the ultimate TV room…you know for playoff time, bowl games or just a really cool Saturday with friends, look no further. In addition to the number of tuners, the main difference between the TECH3-6CC and TECH4-8US is what kind of TV signal it will support. The TECH3-6CC has 6 tuners and supports ATSC Clear QAM. The TECH4-8US has 8 tuners and only supports US cable. 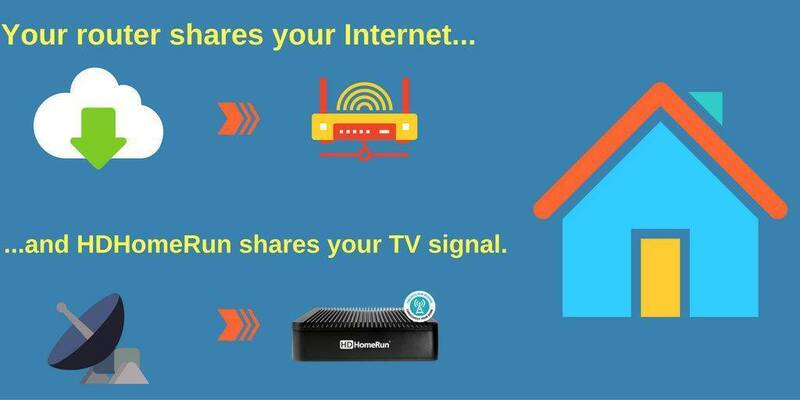 Getting HDHomeRun for your home network is about as close to a “no-brainer” as you can get. If you’re anxious to watch live TV online on your Android box or Android TV, then it’s one of the best ways to do it. Unlike some other methods, it is completely legal no matter where you live in the world. Even if you’re not a cord-cutter, you could still save money each month by not renting a cable box for every TV in your house. I’ll be going into more depth with the HDHomeRun Extend, their Android app and Kodi plugin soon. Stay tuned for more soon. Find the best prices on the entire HDHomeRun lineup at Amazon.com, or if you want even more TV simultaneously, check out the SiliconDust TECH lineup at Solid Signal. Perhaps I misunderstand, but if one lives outside of the major cities our broadcasters are not providing much off air content. For example, here in the Okanagan valley we have the choice of one…Global. No CBC, no CTV, no CITY. So, we have nothing to stream via one of these boxes. I bet many Canadians are in the same boat. Hi Maurice. I love that area, actually. When I lived out on the West Coast I made it as far as Harrison Hot Springs. It’s a beautiful part of BC. To your point, yes, you may get limited use out of an HDHomeRun and an HD antenna. Ditching cable TV entirely may not really be an option where you live. But…you could still use one of these to split your cable signal to all your devices 0 even your mobile phones and tablets. That way you could at least save some money by not having to rent multiple cable boxes. Hope it’s okay to chime in. I’m on Salt Spring Island, BC and determined to get as close to cutting the cord as I can. I don’t have a streaming box and am reading your articles and reviews with zeal. I am a techno moron but the research I’ve done leads me to believe that as long as there is internet access via the device all the CDN and US and Euro networks can be streamed through their websites, Knowledge Network here in BC and also PBS and BBC. I know I’m missing a huge chunk of knowledge but it seems to me to start with a solid box and add on the fave TV networks, etc, etc.. Or am I over simplifying?? TIA!! Hi Brenda. In my experience, it depends on the website. I’ve seen some websites (like CW or Fox) which will let you stream full shows after they’ve aired. Others, like CBS will have a dedicated pay service that you need to use. Some others don’t have any option whatsoever. Unfortunately, it can be very hit or miss. If I own an android box, will I be able to split the signal to other tvswith this box? Hi Tony. Unfortunately not. This works in the opposite direction as you’re thinking. You can split one incoming TV signal (cable or broadcast antenna) to different devices. will i be able to see all cable stations (upwards of 100) on my other tv using this box. If you are using this with your existing cable subscription, then yes. You’ll be able to see everything on all your TV sets. Off subject but If I remember correctly in “Ind Jns & The Raiders of the Lost Ark” They discovered the Ark of the Covenant which was imprisoning the Well of Souls and they found the Holy Grail in the form of the cup of christ in “Ind Jns & The Last Crusade”. I know what a d*#k right? Cant help it. My bad. Just reading about the live tv. I have an android box and we have the live tv and it crashes all the time our provider is not assisting to re set it up. Can I do this myself through an app or do I have to buy the Hd home run box.